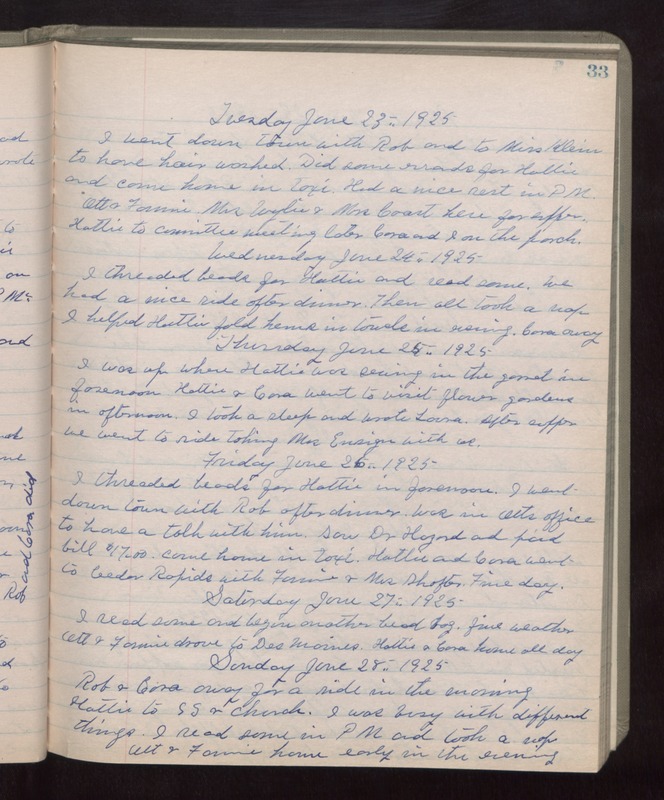 Tuesday June 23rd 1925 I went down town with Rob and to Miss Klein to have hair washed. Did some errands for Hattie and came home in taxi. Had a nice rest in PM. Ott & Fannie, Mrs Wylie & Mrs Coast here for supper. Hattie to committee meeting. Later Cora and I on the porch. Wednesday June 24th 1925 I threaded beads for Hattie and read some. We had a nice ride after dinner. Then all took a nap. I helped Hattie fold hems in towels in evening. Cora away. Thursday June 25th 1925 I was up when Hattie was sewing in the garret in forenoon. Hattie & Cora went to visit flower gardens in afternoon. I took a sleep and wrote Laura. After supper we went to ride taking Mrs Ensign with us. Friday June 26th 1925 I threaded beads for Hattie in forenoon. I went down town with Rob after dinner. Was in Otts office to have a talk with him. Saw Dr Hazard and paid bill $17.00. Came home in taxi. Hattie and Cora went to Cedar Rapids with Fannie & Mrs Shafter. Fine day. Saturday June 27th 1925 I read some and began another bead bag. Fine weather. Ott & Fannie drove to Des Moines. Hattie & Cora home all day. Sunday June 28th 1925 Rob & Cora away for a ride in the morning. Hattie to S S & church. I was busy with different things. I read some in PM and took a nap. Ott & Fannie home early in the evening.